It is important as a tightlacer to be mindful to control your daily intake of food, salt, and water. 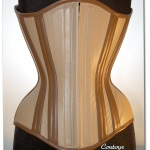 The pressures of the corset will often hinder the urges of hunger and thirst, so regardless of whether or not you are thirsty or hungry you have to make sure that you still eat regularly and drink at least 6 to 8 glasses of water a day. You also need to avoid salty foods and snacks, because higher salt will make you retain fluids, and you want to avoid that for the reasons I mentioned before. When you eat, don’t be afraid to let it out a bit on the top. It is important to allow room to accommodate your food and your digestion will be more complete. Too much pressure on the stomach can accelerate the passing on of the food to the small intestine and it is not good to have that going on all the time. If you get heartburn, or develop a bitter taste in your mouth after you eat then you have stomach acid getting past your esophagus and you need to take the corset off for a bit. Your stomach will get used to functioning normally while compressed, but it takes time for that to happen, and even very experienced tightlacers have to take off the corset if they intend to eat a large meal, so don’t be reluctant to take the corset off during the time of day that you have your larger meals. It is very important to maintain regular bowel movements when you tightlace, and you must never allow yourself to become constipated. You need to get your body trained into a cycle of no longer than 24 hours from eating to passing it out, so you develop habits that will keep things moving right along. Staying regular is essential, and the biggest factors are drinking plenty of water, restricting your carbohydrates, emphasizing a higher protein and low fat diet, and eating plenty of vegetables and fiber. I find that having a cup of yogurt each day helps maintain the necessary fauna in the digestive tract, and this assures better digestion too. Wearing the corset while going to the bathroom is a fundamental tool in repositioning the digestive tract in a healthy and natural way. Your bowel is made up of a system of muscles and chambers. As peristalsis moves your waste along, the rhythmic contractions of the large intestine also move the colon around. In this way the colon will change its shape by itself over time to acclimate into the space and location you are giving it in the corset. All the more reason that your corset must be made in a way that takes this process into consideration in providing you with the proper shape for this to happen safely. these processes than most people, but with good reason. Tightlacing is all about control and self discipline. Control of your body functions is an essential part of your lifestyle as a tightlacer. The more you establish control, the sooner you will reach your goals, and the healthier and more content you will be.